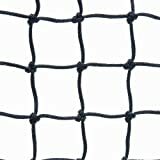 We are so confident of the durability of this net it comes with a LIMITED 3 YEAR WARRANTY. Constructed of heavy duty vinyl coated headband and 3.0mm braided polyethylene net body. Includes 7/8"diameter fiberglass dowels and center strap. 42' length only.